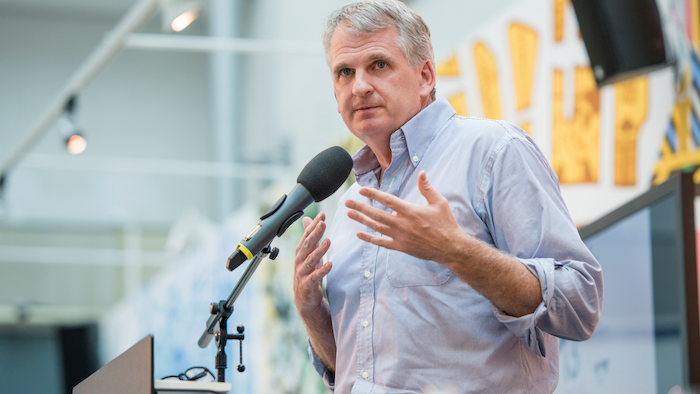 Timothy Snyder is the Richard Levin Professor of History at Yale University and a permanent fellow at the Institute for Human Sciences in Vienna. Snyder specialises in the history of Central and Eastern Europe and as a leading public intellectual he has also commented extensively on the state of current politics in both the US and Europe. He has authored numerous books, most recent among them being The Road to Unfreedom: Russia, Europe, America. I am a teacher and historian, my main field is Eastern European history and I use German and Russian sources. So, I find the most exciting thing happening in the field is people using Eastern European languages, along with Western European languages and others, to try and bring together global history and European history, and bring together the history of colonialism and anti-colonialism. As Joseph Conrad once argued, there are ways to make European history and global history work together if you pay attention to Eastern Europe. Only God would be self-aware enough to answer that question and even God might have problems! Every ounce of my training as a historian tells me that this type of question is very hard to answer. You need multiple sources and lots of time. I would say that every book I write turns out to be different to the book I thought I was going to write. Whenever we try to write something, we are throwing ourselves into sources with questions. If we look at the sources, not only do the answers change but also the questions themselves. The constant for me, with the books that I have written, has been to recognise that you are always asking the wrong questions. The world will help you ask the right questions. This is not something new which I have now learned – it surprises me every time. This is something good about being an historian. In 2005 a quarter of the world’s population was online and by 2017 over half, but according to Freedom House every year in this period saw an increase in authoritarianism. You have argued that the growth of the internet is moving us towards a form of fascism rather than liberalism. Do you see historical parallels when looking at the growth of earlier forms of communication technology? The statistics from Freedom House relate to the decline in democracy, which I roughly correlated with statistics from other sources about internet penetration. It is very important that we look at that for the way it is if we are going to argue about the impact of the internet on freedom and democracy. If you try to correlate the two, the correlation is entirely negative, which is very striking. Along with inequality, the spread of the internet and the decline of democracy may be the two biggest stories of our time and they are not working together in the way the happy talk of the internet would want us to think. I think there is a reason for this, which is that the internet is presented to us as an example of something expanding our individualism, whereas in fact it very often forces us into psychological or neurochemical terrain where we are not individuals. Our fears and anxieties are the things which we have in common and that are most generic about us. All of the contact with something which is not human is through the languages which the machines are writing to which we adapt ourselves. There is no particular reason to think that situations which are comfortable for machines (for example infinite information, quick decisions and binary choices) are comfortable for an individualistic person – and I do not think that they are. Regarding the printing press, we now think that the book is a calming force in life and it probably is. But for 150 years the printing press certainly was not. It was a contributing factor to the religious wars and the death of roughly a third of the European population. When we look at the internet, we should think about the history of the book. As a new communication technology it is going to be destabilising, but we also know that it does not have to be that way. You can make it work in a different way – and that is what the history of the book tells us. You argue that the decline of local newspapers in the US has led to people referring to the ‘media’, as a form of distant or impersonal news, as opposed to traditional local ‘reporters’ who were more familiar. Has this disconnect between the people and the news increased their vulnerability to conspiracy theories? This is actually a development which was observed by other scholars – scholars in Russia first, which is what is most interesting about it. The decline of local news in Russia opened a vacuum which was filled by television news, run centrally. It then invited people to distrust it. This led Russia to a radical format to which others may be headed, which is that the government learns to govern from a condition of mistrust. It says to the people ‘you do not trust anything’ and that there is not really such a thing as truth, but you should nevertheless trust our lies and not somebody else’s lies. This is similar to how President Trump is trying to govern the United States. He does not expect people to believe him literally, he just expects that people are going to like his lies or that they are going to feel right for them. In relation to local news, remember that we do not like the facts and we are not ‘supposed’ to like them, but they are there for us and they provide ways for us to configure our interests. The only way we can talk to other people is with some common understanding of the facts, for example whether or not our water is polluted or whether or not the teachers in our school are on strike. We might not like the facts, but they are the things which might bring us together. We do not have to like local news any more than we like the local doctor, but when we look at the locality of it, it means that we might believe in it in a different way to how we believe in the things which make us ‘feel good’. When local news goes away, then our sense of what is true shifts from what is helpful to us in our daily lives to what makes us ‘feel good’, which is something entirely different. You have used the term ‘dark globalisation’ in reference to unseen external actors identifying flaws within democratic societies and exploiting them. A foreign power can ‘teach’ voters that a political movement within their own democracy is the ‘enemy’. Does political partisanship limit the ability of democracies to protect against this form of interference? Political partisanship seems to work very nicely with that form of interference. If you look at the UK, almost no one is talking about the fact that the Brexit referendum was held in conditions which were inappropriate for the 21st century. It was held in conditions which allowed multiple foreign actors – but above all one – to interfere seriously in the debate on Twitter but also in the debate on the ground. The idea that one is simply going to look aside from that and plan one’s post-Brexit career in an England full of chaos and inequality (which seems to be the strategy of a good deal of the leadership of the Tory party right now), seems to be an unfortunate way in which partisanship and foreign interference can work together. Likewise in the US, the Republican Party knew perfectly well in 2016 that Russia was intervening on behalf of candidate Trump. They were made aware of this and they simply chose to treat it as they treated the facts of the world – as a partisan issue – and that anyone who talked about this was just a Democrat ‘whining’. The result of this is that we now have an unusual mixed regime, where clearly Russia has an important part to play with the executive and meanwhile the legislature passes laws which it has always wished to pass. That makes the opposition all the more upset, because the Democrats are not only upset about the policies which they do not like, but also about the fact that it was not a fair fight in 2016 – which it was not. So the two things unfortunately work together. If you let your institutions get so lapse that a foreign power can intervene in your elections, then partisanship is probably going to get worse afterwards – which suits that foreign power very well. Could you explain what is meant by a ‘politics of inevitability’ and a ‘politics of eternity’? I try to talk about the present in a way which is not just about democracy and authoritarianism or stating that we had democracy and now by surprise we do not. By the ‘politics of inevitability’ I mean the assumption that we know the future from the present and that there are not really alternatives. That notion has disarmed people who believe in democracy or individual rights because they somehow think that history will do the work for them – which it does not. The ‘politics of eternity’ is what we fall into afterwards. With the politics of inevitability we give up our sense of responsibility and then when things go wrong, we are very vulnerable to the notion that it is not our fault. Things always go wrong and the enemy is always at the gates. It is very easy to slip from a regime like Obama’s to a regime like Trump’s, because it is very easy to slip from ‘everything has to go well’ to ‘everything has to go disastrously’. In both, the common denominator is that there is no sense of individual or civic responsibility. In the ‘politics of eternity’, you say that there is no future – everything is about the past, for example ‘make America great again’ or in the case of Brexit, imagining a Britain which existed in the middle of the century but which will never exist again. It means you do not have to talk about the future – because the future has gone. You just move back into the past and create a sense of threat from the outside which circles around repeatedly. Russia is the most advanced in this. The Russian government, for various reasons, cannot allow people to think about their future. But we seem to all be rather drifting in that direction. The problem with not having a future is that if you do not really feel a future, there is not going to be democracy. Democracy needs historical time – the two sit together in a very intimate way. If we accept the premise that the Russian government interfered in the 2016 Presidential election in favour of candidate Trump, do developments such as the extension of US sanctions toward Russia indicate a miscalculation on the part of Russia? First of all, in relation to whether we accept that premise – the evidence is overwhelming. I try to summarise the evidence from all over Europe and the US in Road to Unfreedom. There is also a new book by Kathleen Hall Jamieson called Cyberwar, which very effectively summarises the more recent American evidence. But I agree that the Trump presidency has probably led to some things which Russia did not expect. Russia does not understand the US completely – they understand the parts of the US which are most like them. The intervention succeeded because it appealed to some things in the US which they recognised, including inequality and racism. They used the parts of the systems which are most open to them and they used them well. But that does not mean that they defeated the whole system. They think that the rule of law is really a joke, but in the US law is not entirely a joke. It is a mistake to think that the president, as head of state, runs everything – that is just not true in the US political system. Naturally things were not going to go the way Russia expected them to go entirely. The other factor is that Russia likes things to be unpredictable, so long as they are causing the unpredictability. It is a bit uncomfortable for Russia that Trump is actually so unpredictable. That said, in the short and medium term, this is clearly a win for Russia. Because if you look on the global scale, the US may not always do the things which Russia wants, but the US is so much less present in the world and so much less able to restrict the kinds of patterns in world politics which the Russian leadership takes as normal. With regards to the policies which are not in Russia’s interest, such as the increased US sanctions, Trump opposed all of those policies – in speech and in writing. He essentially apologised to Russia for them. Trump is, in some way, clearly beholden to Russia in a way which the US congress is not. If we imagine a situation where the president was not beholden to Russia, then we would probably have a still different set of policies and we certainly would not have the spectacle as we did in Helsinki this summer of an American president standing up and saying that he trusts the head of state of a foreign power more than he trusts his own institutions. What is the most important advice you could give to scholars of International Relations or those interested in studying the current state of relations between Russia and the West? I would not presume to be the person who could give people the best advice. But I think it would be very interesting to start from the premise that the reality that matters is not necessarily the reality which international relations theory has been good at documenting. What was the reality which led Russia to defeat the US in a cyberwar in 2016? It was not economic power (the Obama administration believed that economics decides things – that turns out not necessarily to be true). It was not state power either, in the sense of traditional military power. Clausewitz reminds us that combat is not the same thing as war – combat is an instrument – and that war is actually won in the minds and will of the enemy. The way in which the world is set up in the 21st century, you can get to the minds and the will of the enemy without traditional combat. The internet allows for that. It might be interesting if people studying international relations start from that point – the way in which the internet actually works and relates to people’s neurochemistry, fight and flight instincts and basic behaviours – rather than treating it as epiphenomenal or at the outskirts of the international relations field. There are probably lots of people already doing that, but this is certainly something which occurs to me.